Personalized Golf Clocks Custom Engraved or Printed in Bulk. Promotional, Inexpensive. Budget Prices in America. We supply bulk golf clocks with custom engraving at the Budget Prices in USA and Canada . 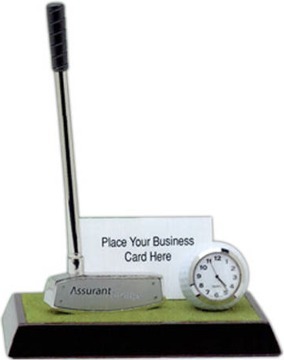 Our custom engraved or printed golf clocks consists of a cystal golf ball with clock, a golf club shaped pen and a business card slot and a rectangle base. Size: 6 1/2" W x 3 1/2" D x 2 1/2"
Arab Numerals Clock with , Round Dial, Second Hand, Minute Hand and Hour Hand. The unit prices below include your 1-color custom engraving, or they are for blank (not custom engraved) golf clocks. We will send you a proof for your approval before production. Setup Charge: $60.00 for engraving; $60.00 per color for printing. Estimated Production: 10 days after art approval.